Can't find the right birthday card for that fun, vivacious friend in your life? Well this is the one for you! This simple but powerful message will let them know how special you think they are and that you're thinking about them on their special day. 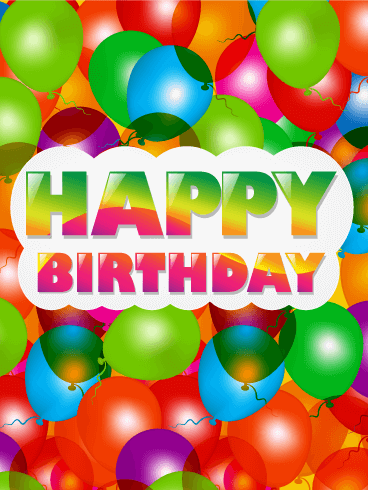 The bright and colorful balloons send a birthday wish of fun and whimsy. The bold orange writing of the message is striking and eye-catching. This birthday card is a perfect fit for everyone on your friend's list! 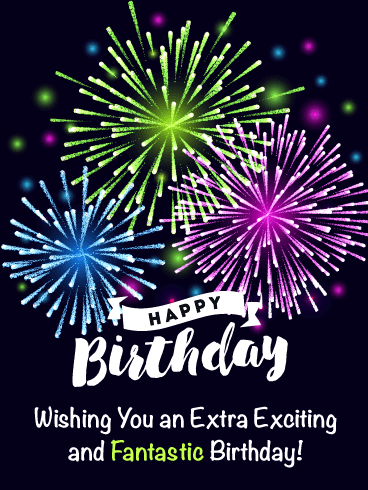 Happy Birthday - Wishing you a birthday celebration that is as fun, bright, colorful, and exciting as you are! Have a great birthday. This bright and cheerful birthday card is bound to brighten up anyone's birthday. Its sing-song phrasing is playful and cute. The card's colorful balloon and streamer motif is celebratory and fun. This birthday card is perfect for all ages and relationships. This card has everything you're looking for in a birthday card! Cuteness alert! A puppy on a pillow with a special birthday message? Yeah, it doesn't get much cuter than this! 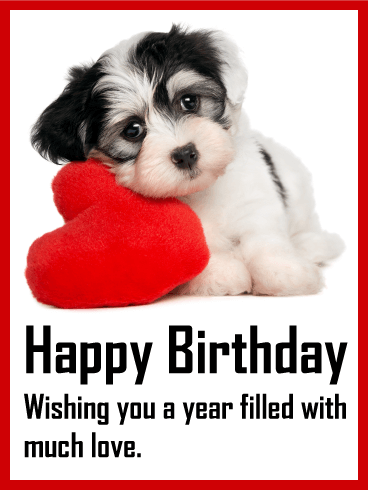 Wish someone a year filled with love when you send this sweet puppy birthday card. Look at those eyes! They are too adorable to resist. If you need a card for an animal lover, this is the one for you! They will love getting a birthday greeting from this cuddly pup. This festive birthday card comes with a fun-filled message for its recipient: "It's your day. Celebrate in a BIG way!" 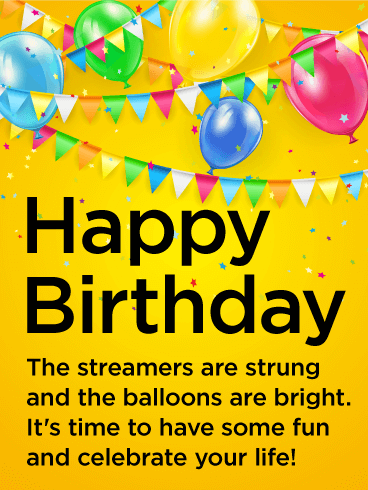 Bright, colorful balloons and streamers add to the cheerful tone of this birthday greeting, which is perfect for anyone you know who hopes to be surrounded by lots of gifts, delicious cake and a party full of family & friends, who make turning another year older so much better! Need a dynamite birthday card? Why not send this stunning display of golden fireworks to celebrate someone's special day? This festive birthday greeting really wows and excites. It's a sure-fire way to get the party started and wish someone the happiest of birthdays. This sparkly birthday card is fun-loving and really pops. The bold text is backlit in purple neon lights and surrounded by a grand display of firecrackers bursting in the sky. 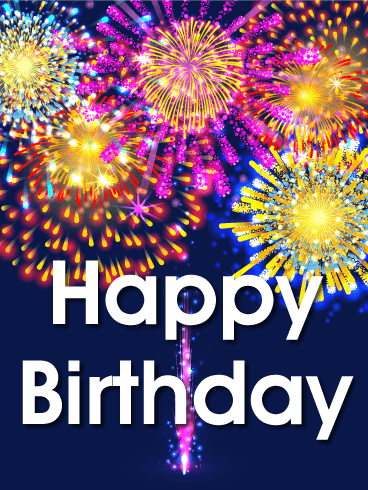 Celebrate good times when you send this explosive and colorful birthday card! It is a dynamite way to wish someone a very happy birthday. Bright, technicolor fireworks light up this birthday card. A fun birthday greeting to add some pop and pizzazz to your friend's special day! Who doesn't love fireworks? This birthday card puts on a good show of eye-catching sparkles and bold bursts of color. Do you know someone who has a birthday today? Then it's time for a celebration! This fun Happy Birthday card has all the best parts of a fantastic birthday party. The colorful balloons, glitter, bright pendants, and delicious cake will bring a smile to your loved one's face and joy to their special day. 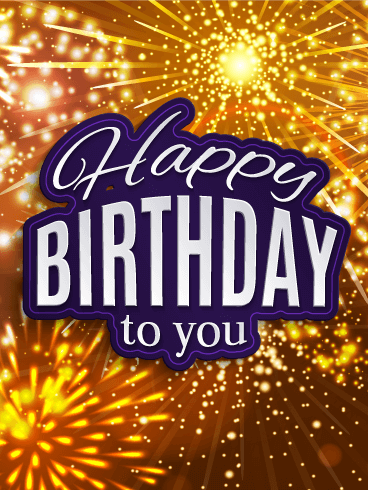 Send it with your birthday wishes today! Does your loved one shine brightly in the lives of everyone they know? Are they a beautiful, powerful explosion of joy to everyone they meet? Then send them this Happy Birthday card! The bright, sparkling fireworks are beautiful and exciting - just like your friend or family member! 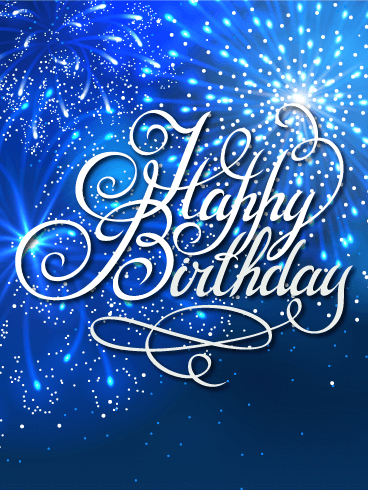 Celebrate their special day by sending your birthday wishes with this glittering birthday card! It's Happy Birthday time! Add fun and color to your loved one's birthday by sending this colorful Happy Birthday card to celebrate their special day! Like all the best birthday gifts, this birthday card is bursting with balloons and cheer! 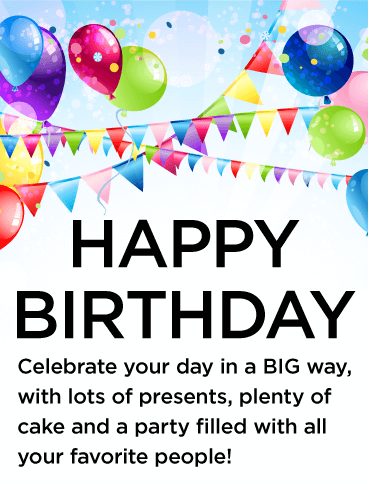 Make a big deal of your friend or family member's birthday by sending this exciting card to say "Happy Birthday" today! 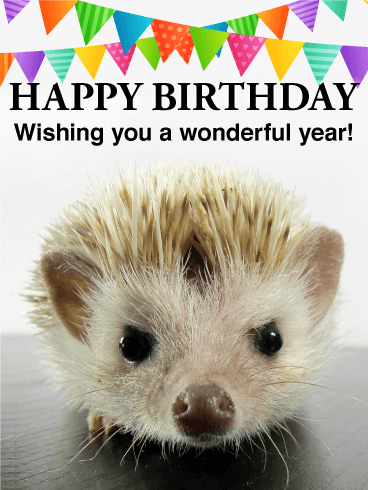 This sweet little hedgehog wants to wish your loved one a Happy Birthday! If you have a friend or family member who is celebrating a birthday soon, this is a great Happy Birthday card to send! The adorable hedgehog will make them smile and laugh, while the sweet message will let them know you care. 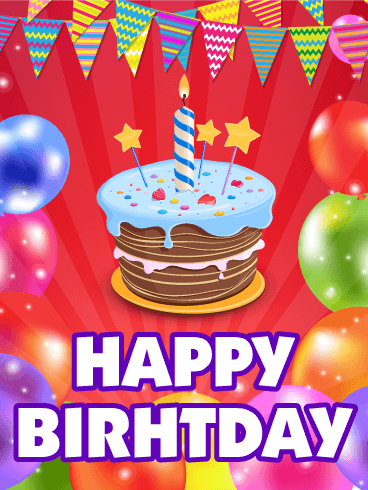 Send your birthday wishes with this birthday card today! What's sweeter than a puppy? This Happy Birthday card! 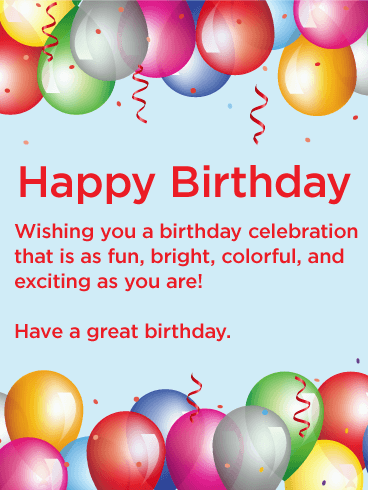 If you have a friend or family member who is celebrating a birthday soon, send your birthday wishes with this fun birthday card. 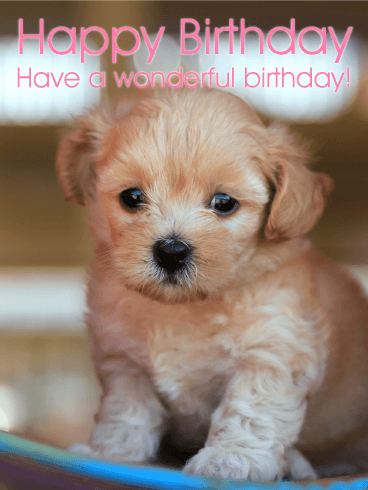 The cute puppy and sweet message will warm hearts and make any birthday the best day ever! 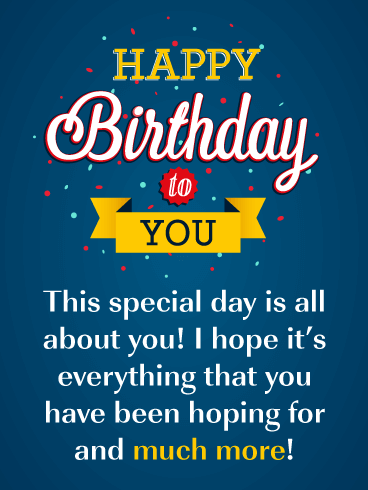 Make this a birthday everyone will remember by sending this card today!